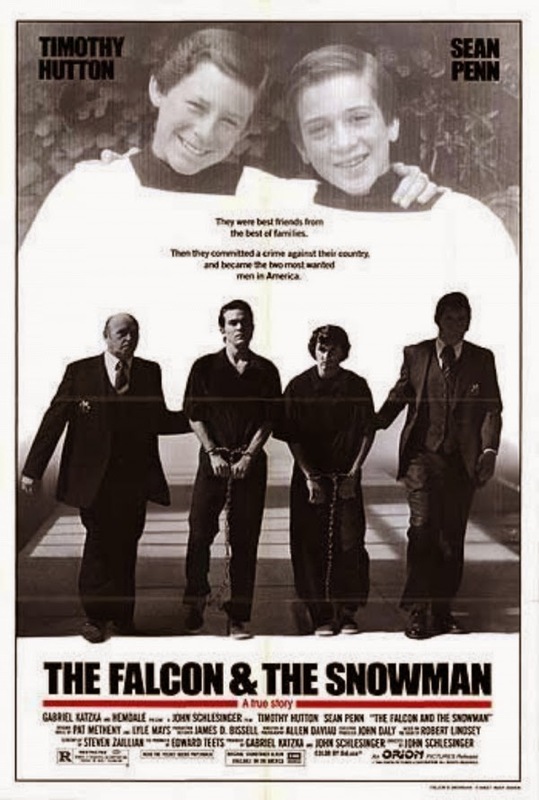 Rupert Pupkin Speaks: Kino Lorber Studio Classics - 52 PICKUP, THE FALCON AND THE SNOWMAN and F.I.S.T. on Blu-ray ""
I remember back in my VHS days, I had the nasty habit of ghettoizing movies based on their video distributors. This may have had something to do with the fact that certain companies put out their movies in Long Play (LP) or the dreaded Extended Play (EP) instead of the higher quality Standard Play (SP). Perhaps a part of me was thinking the movie would look even worse than the average VHS but I know that in the back of my mind I made assumptions about the films quality. 52 PICKUP was distributed primarily on VHS through a company called "Video Treasures". They were notorious for cheap tapes recorded in lower quality formats. This kind of amuses me now because of it being a Cannon Films release and all. At the time, I had seen many of Cannon's "finest", but had never tied them all together under the banner that has come to represent a bundle of nostalgic trash for so many of us. Cannon made kind of a specialty out of the revenge movie genre. I can see why they favored them. After all, revenge stories tap into this very primal nature that we all have. Whether or not we've even ever had a revenge fantasy. Another thing that I always found memorable about Cannon Films was that they were never afraid to make the villains in their movies really despicable scumbags. In the case of 52 PICKUP the heavies are two pornographer types and a cold-blooded killer. These guys are what you might call "not nice" and have no qualms about ensnaring some guy that they see as a wealthy schnook into a blackmail trap. They aren't even deterred when the guy tries to cut them off at the pass by telling his wife. Cannon's choice to produce an adaptation of Elmore Leonard with John Frankenheimer as director gives this outing a slight edge of prestige that some of their other efforts don't have. Yet it's still grittier and more exploitation-esque than a lot of straight ahead Hollywood Studio films. Golan-Golobus also didn't seen to have much fear of casting older actors. Roy Scheider and Ann-Margret were 54 & 46 respectively when they made 52 PICKUP. Outside of the occasional "aren't old people funny" comedies, older actors don't get a hoot of a lot of headlining work. To Cannon (and probably the foreign territories they were selling to), the actors that starred in JAWS and VIVA LAS VEGAS were still very valuable commodities. And rightly so. Their performances here are solid. Oh and don't let me forget to mention a few other lovely ladies in the cast of this movie - they being Vanity and Kelly Preston. Cannon was also always acutely aware of the need for attractive gals to fill out the smaller roles in their very macho, male-centric movies. Movies about arrogant (or naive) stupid people can have an inherent sense of suspense to them when those people happen to be the main characters. The film begs the question, "who is the more foolish, the fool or the fool who trusts a drug dealer to help trade U.S. Government secrets with the Russians?" It's a good question and becomes the dramatic crux of the story. And a fascinating story it is and one that is based in some truth which is pretty nutty. See my embedded Youtube videos below for something of an addendum to the real life story. 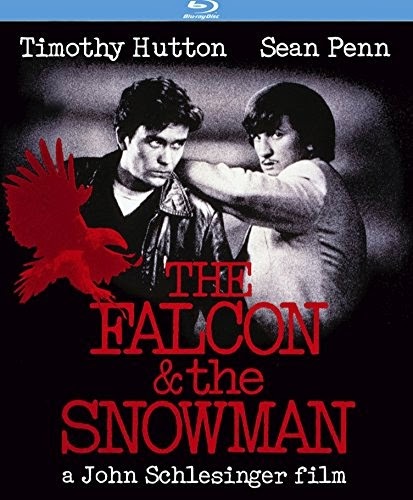 In FALCON AND THE SNOWMAN, Sean Penn plays one of his most weasely characters here and even seemingly adjusted his voice for the role to make it sound more nasal-y and whiney. His extra thin John Waters mustache is a nice touch too. It really impresses me when an actor can take what is ostensibly a very very unsympathetic character and humanize him. Daulton Lee (Penn) is, as I said, a drug dealer and kind of a scumbag. Penn brings this charisma and this sensitivity to him that is not an easy thing to pull off. Most films with somebody like Daulton in them would paint him as the bad guy right out of the gate. That wouldn't work here though as we have to believe that Christopher Boyce (Timothy Hutton) would actually trust Lee enough to involve him in his scheme/act of protest to sell classified information. Penn shows great poise as an actor in pulling off a slightly subtle/slightly not descent into what is basically paranoid madness. He makes Daulton's ego and his lack of some common sense (as he gets caught up in the plan) his fatal flaw and it feels as real as this kind of story can because of him. There's more going on here than just Penn though mind you. You've got an excellent director in John Schlesinger. His credits prior to this movie include the likes of MARATHON MAN, THE DAY OF THE LOCUST, SUNDAY BLOODY SUNDAY, DARLING, BILLY LIAR and of course MIDNIGHT COWBOY. Based on his resume, it's easy to see that Schlesinger knows what he is doing and has a certain expertise in bringing rather tragic narratives to the screen. With FALCON, he had the assistance of screenwriter Steve Zailian. Zailian cut his teeth on FALCON and would go on to write SCHINDLER'S LIST, AWAKENINGS, SEARCHING FOR BOBBY FISCHER, GANGS OF NEW YORK and others. He's continued to be a force in film writing even recently with his scripts for MONEYBALL, THE GIRL WITH THE DRAGON TATTOO and even last years EXODUS: GODS AND KINGS (for Ridley Scott). Suffice it to say there's a whole lotta talented people present here and the final product is a very memorable (though oft overlooked) film from the 1980s. Sylvester Stallone has demonstrated his dynamism as a performer from his earliest film outings. I'm not just talking about ROCKY here, I mean even in stuff like LORDS OF FLATBUSH and DEATH RACE 2000. Even when he's seemingly mumbling his way through smaller roles, he's always been a fella that pops off the screen. This is a powerful story of the early days of the American Labor movement in Cleveland in the late 1930s. It's one thing for Stallone to carry a film in a movie like ROCKY, but this is altogether something different. He has to be a believable leader, a compelling speaker and to carry a certain wisdom with the way he presents his character as he gets older. You see, this is one of those movies that spans many decades and it has a rather abrupt jump forward in time at a certain point. This kind of thing doesn't necessarily bother me though. Here, it's handled okay, but it is a tough thing to pull off. I do like it though when a movie doesn't feel like it has to hold your hand through every little event in a character's life. Director Norman Jewison is a solid, workman director who was able to wring special impact out of socially conscious material like this. I find it amusing that this movie was written by Joe Eszterhas who is now most well-known for scribing BASIC INSTINCT, SLIVER and SHOWGIRLS among other things. This was apprently his first produced screenplay. The cast is quite lovely and includes Peter Boyle, Melinda Dillon, Rod Steiger, Tony LoBianco and Kevin Conway. Cinematography by the great Laszlo Kovacs. Music by Bill Conti. This disc features an 18 minute featurette called "The Fight for F.I.S.T." which includes interviews with Joe Eszterhas and Norman Jewison. Both talk about their beginnings with the movie (and in the case of Eszterhas, the start of his career). 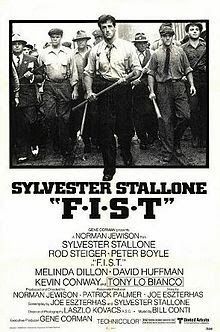 They also discuss Jimmy Hoffa and their fascination with him and it's clear that he was one of the big impetuses for Stallone's character in the film. 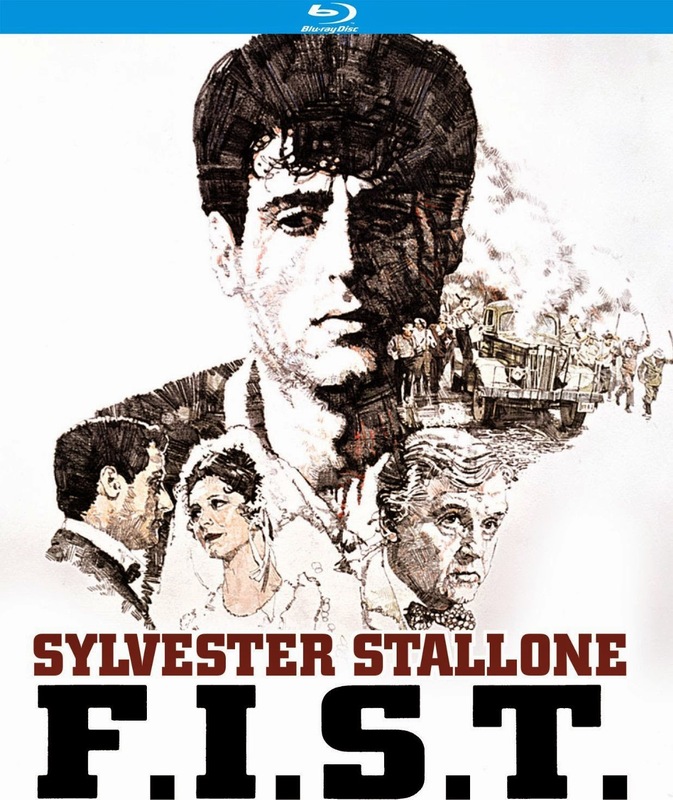 Jewison also talks about how Stallone came to be cast in the movie (which helped it get made). Watching it now Chris, much appreciated!